When failing a state, the systempunkt is the target which inconveniences the largest number of people through the reduction of critical services. When coercing a foreign state, the systempunkt is the target which has the greatest impact on that state's connections to global markets. In some cases, they are one in the same. NOTE: I've been asked by a company to provide insight into a model of next generation warfare that the US security establishment can wargame against. To get my head in the game, I am channeling (in my meager way) Sun Tzu. The Balochistan Liberation Army (BLA) took their campaign of systems disruption strategic this week with two attacks on Pakistani railways in Punjab. The first one caused a train crash and the second was a near miss. In addition to these attacks, the BLA is concentrating their attacks on electricity and natural gas production in Balochistan province with innovative attacks on codependent systems. This sophisticated systems focus reflects the relatively high level of education of many of the group's members (they are evolving quickly). We should expect to see power and gas deliveries to Punjab disrupted throughout the next year despite any and all efforts by Pakistani militias to crack down on the province. Also, the plans for a trans-Pakistan natural gas pipeline between Iran and India are on hold until this conflict is resolved (at a cost to Pakistan of $500 million a year). Port Harcourt, Nigeria. There have been two large robbery/raids on corporate compounds in the past week. The first was on Agip's (an Italian oil company) headquarters where seven were killed. The most recent was on Saturday when Daewoo's (a South Korean conglomerate) compound was raided and $285,000 was stolen. The objective of these raids and recent kidnappings, beyond the immediate financial gain, is to coerce corporations. It's working. In further signs that this movement is adopting global guerrilla methods: 1) they have released the foreign hostages after a payment of $770,000. The moral damage to the marketplace was already maximized (Shell has withdrawn 500 employees and hundreds of contractors have fled), and a bloodless release makes it easier for corporations to deal with them in the future. 2) the group has set a GOAL (!) of a 30% reduction in Nigerian production by the end of February! Naturally, the research analysts at the major global banks/hedge funds and government agencies are scrambling to understand the implications of this new wave of violence -- given that the fate of several major corporations, a trillion dollars of oil, and the world's oil price is at stake. Unfortunately, this effort may fall short given that the type of warfare that is evolving in Nigeria (and other places) is very new and complex. To really take full advantage of this opportunity (for financial speculators) or to mitigate the risks (corporate participants that want to limit their downside risk), a team that combines expertise in the oil market, regional knowledge, and this new form of warfare (this analyst has built an excellent track record by anticipating outcomes in Iraq, Nigeria, and Russia) should be assembled to build an actionable model and potential scenarios. Further, this model could even be built as a service delivered via a private Web site for a hefty subscription (also something I have tons of experience with). The potential profit here is limitless and the downsides are catastrophic. Things are starting to move in earnest. UPDATE: It appears that some global hedge fund managers think the same thing (although their scenarios need lots of work). William Gibson: "The future is here. It's just not widely distributed yet." Even entire nations are vulnerable to systems disruption. Systems attacks can provide amazing leverage. An afternoon's work knocked out a country for more than five days. It can be repeated again and again. The attack was simple, the vulnerability is vast, and the attackers weren't caught (nor are they likely to be). In this new substrate (nation-states vs. non-state networks within a global, information economy), global guerrillas will use a similar insight to win decisive battles. In this context, the conventional armies of nation-states aren't the target, a nation-state's economic and societal infrastructure is. Specifically, our large urbanized population centers are reliant on a complex set of relatively automated infrastructures. The operational objective of the global guerrilla warfare will be to separate a large urban population from its infrastructure and take advantage of the collapse and chaos that results. Whether it was the Chechens or some other group (Ossetians?) we may never know. However, its clear that Russia's dispute with the Ukraine provided the impetus for some guerrilla strategist to make the leap to systems disruption. We saw the results of that inevitable leap on Sunday. We can expect to see more of this in the future. The control over the price of oil is in now in the hands of global guerrillas -- the open source, system disrupting, transnational crime fueled, sons of global fragmentation covered by this author. These actors can now, at will, curtail the supply of oil through low tech attacks on facilities in Iraq, Nigeria, central Asia, and India. The amount of oil effectively under their control exceeds five million barrels a day, more than Saudi Arabia's two million barrels a day of swing production. Delegitimization of the target state. Attacks meant to "hollow out" the state, through an inability to deliver critical services or a denial of income/investment, to create zones of local control. Coercion of the core Western states. Either to damage the US or a target state through economic means. Criminal profit. By increasing the prices of oil and its refined products, the profits generated by criminal enterprise (bunkering of oil, smuggling, etc.) are radically improved. An expansion of the guerrilla oil cartel to new locations. The success of guerrillas to control production in Iraq and Nigeria will spawn similar developments in other locations. High on that list is Russia, the world's largest oil producer, and the Caspian Sea producers. Market corrections. High oil prices will eventually result in a global recession that would reduce demand. However, this reduction in demand may not be enough to reduce prices and may only reduce their ability to increase. Alternative energy sources and conservation will over the longer term gain considerable traction. Those companies/localities that are planning for high oil prices by radically increasing the efficiency of their products/infrastructures will reap windfalls in the future. Collusion between global guerrillas and other market participants. So far, there isn't any signs of coordination between groups. This will change. As we have seen in other situations, network connections will develop and open source coordination and collaboration will occur. Additionally, global guerrillas may find useful and powerful allies among states (Iran?) that desire to curtail production, corporations (CNOOC?) that wish to wrest control of oil production from competitors, and market participants (hedge funds? or individuals?) that desire to profit from rapid price changes. If this surprises you, remember that in Adam Smith's world, it doesn't matter how you make a buck, it's only important that you make it. An unfortunate consequence of the war in Iraq has been rapid improvements in the ability of guerrillas to disrupt modern infrastructure (oil, gas, water, telecom, etc.). The wide ranging success of these attacks has eliminated any potential economic gains from the tens of billions of dollars spent on the US reconstruction effort and seriously damaged the legitimacy of both the US occupation force and sequential Iraqi governments. The impact of this reverse "effects-based operation" has not gone unnoticed. Al Qaeda's leadership has made systems disruption a central aspect of its campaign against the West. Recent information indicates that the concept has become the topic of widespread discussion among members of Jihadi forums. On these forums there is a growing realization that the only way to damage the West strategically (without a nuclear weapon) is through the destruction of critical global economic networks. Stephen Ulph of Jamestown summarizes recent activity on these forums. His group found detailed documents that provide explicit instructions on facilities and pipelines that are termed global "economic joints". For example, one set of instructions provided data on the Alaskan oil distribution infrastructure and recommendations for maximizing the value of the attack. While this effort is still in its adolescence, Ulph has detected signs of the type of collaborative open source development we have seen among guerrilla groups in Iraq. If so, it will advance to maturity rapidly. As that happens, be prepared to see a growing emphasis on the selection of targets (or more accurately "systempunkts") that cause cascading system failures -- failures that maximize the scope of the damage to the scale free and tightly coupled networks we see in developed countries. NOTE: It's important to remember that in this epochal war, the guerrillas don't need to achieve either an absolute moral or economic victory. All that is needed in this hyper-competitive globalized economic environment is an effort that damages the ability of the target state to compete -- Adam Smith's invisible hand will quickly take care of the rest. The rapid rise of my global guerrillas -- the open source, system disrupting, transnational crime fueled, sons of global fragmentation -- is a cautionary warning on the limits of western power. As a result, my work is often placed in opposition to the work of the best selling author, Thomas Barnett (The Pentagon's New Map and Blueprint for Action -- well worth reading). Barnett strongly advocates that the Pentagon should be reorganized into a factory for rapidly "processing" failed states into useful global participants (for which he provides an A to Z plan). The objective of this new capability would be to shrink the global "gap" of failed and rogue states to accelerate the end of history (in Fukuyama's sense). Unfortunately, Barnett's thesis has become increasingly central to the Pentagon's (Rumsfeld) and the Department of State's (Rice) planning for the future. What Barnett advocates is bad in two senses: first, that it won’t work, and second, that if it did work the result would be evil. In both books, Barnett divides the world into two parts, the Functioning Core and the Non-Integrating Gap. This is parallel to what I call centers of order and centers or sources of disorder, and I agree that this will be the fundamental fault line of the 21st Century. Barnett’s error is that he assumes the Functioning Core will be the stronger party, able to restore order in places where it has broken down. In fact, the forces of disorder will be stronger, because they are driven by a factor Barnett dismisses, the spreading crisis of legitimacy of the state. By ignoring Martin van Creveld’s work on the rise and decline of the state, Barnett’s books end up anchoring their foundations on sand. What Barnett’s books end up revealing is the combination of moral blindness and international political hubris that characterizes the whole quest for American world empire, a quest initiated by the neo-cons. Like the (other?) neo-cons, Barnett sees the world and its cultures in Jacobin terms, as a combination of Rousseau’s natural goodness of man and Newtonian clockwork mechanism. Just twist a few dials here, throw a couple of levers there and presto!, Switzerlands spring up from Ouagadougou to the Hindu Kush....there is no surer way of making someone your enemy than to announce you will remake him in your image for his own good. To many of the world’s peoples, what Barnett argues for in such blithe simplicity represents Hell, and they will fight it literally to their dying breath. It’s piffle, pure and all too simple. Unfortunately, it is dangerous piffle, both in the evil that would result if it worked and the catastrophes that will come when it doesn’t. Real Fourth Generation theory (JR: as well as my own) counsels caution, prudence and a clear grasp on the limits of American power in a world where the state itself is in decline. Regrettably, in the uneducated and nostrum-hungry powerhouse that is Washington, Barnett’s piffle is just the sort of patent medicine that sells. The more widely it sells, the more Iraqs America will have to endure. Noah Shachtman of DefenseTech quotes Greg Grant of Defense News (a closed site) on how Iraq's guerrillas have developed IEDs that target low flying helicopters engaged in urban patrols or combat. Insurgents, who place these aerial IEDs along known flight paths, trigger them when American helicopters come along at the typical altitude of just above the rooftops. The devices shoot 50 feet into the air, and a proximity fuze touches off a warhead that sprays metal fragments, said Brig. Gen. Edward Sinclair, commander of the Army’s Aviation Center at Fort Rucker, Ala. The bomb-builders may be obtaining radio-guided proximity fuzes from old Iraqi anti-aircraft and artillery shells and mortar rounds. Sinclair said these aerial IEDs have been used against multiple U.S. helicopters. He declined to say whether such IEDs had damaged any aircraft. The new weapon is one way insurgents are taking on Army aircraft, which come under fire between 15 and 20 times a month, Sinclair said. Other methods include small arms, rocket-propelled grenades and advanced shoulder-fired surface-to-air missiles. IRAQ: A large swarm destroyed twenty out of sixty fuel tankers in an Iraqi Oil Ministry convoy built to protect tanker drivers against threatened attacks. These threats, some attributed to Ansar al-Sunna, caused a ten day walk-out of fearful tanker drivers. Operations were resumed when 40% of the refinery's tanker drivers reported back to work -- a number that is likely to decrease after this attack. A second planned convoy of sixty tankers was held near the recently re-openned refinery in Beiji to avoid additional loses. The Islamic Army of Iraq took credit for initiating the swarm. Snapshot of the impact: Lines for gasoline are reportedly up to 2 miles long despite a recent tripling of prices. Violence (assaults, random shootings, and tire burnings) have forced private gas stations in Basra to close, leaving only government stations in operation. The delegitimization effort continues. UPDATE: Gasoline demand is up 30% in Baghdad due to particularly bad power shortages (detailed here) -- people need the gasoline for their generators. Radio frequency IDs (RFIDs), small electronic chips that share information when scanned, are rapidly becoming an essential part of global supply management. In order to correctly route and track items from inception to purchase, these chips are attached to packaging and increasingly the products themselves. "...copies the microwave-oven-method, but in a much smaller scale. It generates a strong electromagnetic field with a coil, which should be placed as near to the target-RFID-Tag as possible. The RFID-Tag then will recive a strong shock of energy comparable with an EMP and some part of it will blow, most likely the capacitator, thus deactivating the chip forever. 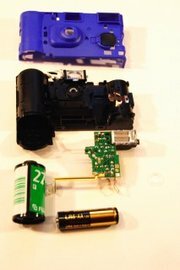 To keep the costs of the RFID-Zapper as low as possible, we decided to modify the electric component of a singe-use-camera with flashlight, as can be found almost everywhere. The coil is made from varnished wire and placed inside the camera exactly where the film has been. 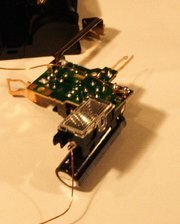 Then the coil is soldered between the cameras electronic and its flashlight. Last but not least most single-use-cameras will require some kind of switch to be build into them, since their activating-mechanism usually is to small and primitive. Once the switch is connected and tested, the camera can be closed again and henceforth will serve as a RFID-Zapper, destroying RFID-Tags with the power of ordinary batteries."